Known as one of the world’s most romantic and lively cities, Paris is a delight for all your senses. Your included city sightseeing tour shows you magnificent must-see sights, such as Notre Dame cathedral, the Louvre museum with its glass pyramid as a contrast to its ancient architecture, the commemorative Arc De Triomphe, and the Eiffel tower. In your free time, stroll down the Champs-Elysées with lavish cafés, or perhaps visit the world-famous Louvre Or Montmartre with its gleaming white sacré coeur basilica and bevy of artists on place du tertre. Paris is also well known for its colorful nightlife, and an optional outing to one of the world’s most famous cabaret shows, the moulin rouge, is available. This morning, board a high-speed train for a swift and comfortable journey to metz or Luxembourg. Continue to remich in the grand duchy of luxembourg, where your river cruise vessel is docked on the moselle river. Before dinner, meet your crew at a welcome reception. The Moselle river is some 312 miles long, rising in the vosges mountains of northeastern france and entering germany at trier. At the head of the Moselle valley is trier, Germany’s oldest city. Some say trier is even older than Rome and that it was populated over a thousand years before the romans arrived. Many roman remains have survived, including a 20,000-seat Amphitheater; The Porta Nigra, the only surviving fortified gate from the original roman settlement, which still gives access to the town’s center; imperial baths; and the roman bridge, Germany’s oldest bridge, with stone pilings dating from 144-152 ad—all evidence of this once-grand roman city. Choose from an included guided city sightseeing or the more history-focused “roman trier” guided tour. 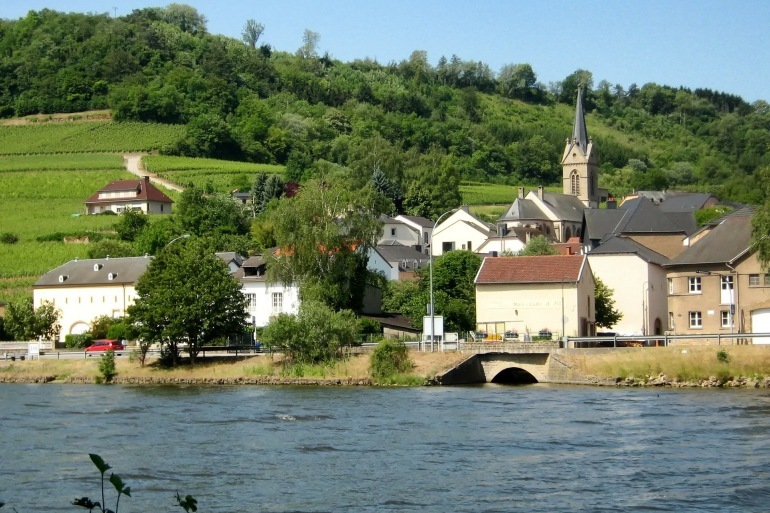 As you cruise the wide, peaceful curves of the Moselle river, it quickly becomes obvious why the Moselle valley is famous for its picturesque scenery, and that this is an important wine-growing region. Today, wake up in Cochem, a picturesque town with half-timbered houses and winding streets full of history and legends that will be brought to life during your included guided walk. Visit Reichsburg castle, built in 1000 ad and filled with renaissance and baroque furniture. Sitting atop a vine-covered hill, this castle offers splendid views of the little town below and of the river valley. Cochem is at the heart of the Moselle wine trade, and the Riesling grape is cultivated here, producing a dry to sweet, floral white wine. This afternoon, learn about this region during an onboard lecture as you cruise to boppard, a spa town on the rhine, where you dock overnight. This morning, sail through the dramatic rhine gorge, the most beautiful stretch of the rhine. Here, ancient castles stand sentry on lofty cliffs rising 400 feet above the waters. Cruise past the legendary rock of the Lorelei, where echoes of enchanted siren song lured unwitting sailors to their doom. In Rüdesheim, the quintessential Rhine valley wine town, visit Siegfried’s mechanical musical instrument museum, where you’ll see and hear a large collection of self-playing calliopes, mechanical violins, and music boxes from the 18th to the early 20th centuries. Enjoy a special treat, then there’s free time to pick up some souvenirs on the narrow, cobblestoned drosselgasse, where colourful flowers, open-air wine gardens, and live music add to the festive atmosphere. Tucked away behind medieval defensive walls and towered gates, picturesque Bavarian Miltenberg is a cultural gem on the banks of the Main River. This afternoon’s guided walk will acquaint you with the town’s delightful Marktplatz (market square) centered around a Renaissance-era fountain, and features striking half-timbered buildings, cobblestone lanes, one of the oldest inns in Germany, Haus zum Riesen (the giant’s house), and the gothic splendour of the Merchant Hall. Relax on board this morning as you cruise the Main River. This afternoon, arrive in Würzburg. Surrounded by verdant hillside vineyards, Würzburg, the “Pearl of the Romantic Road,” makes an immediate impression with imposing Fortress Marienberg perched above town and the 15th-century Alte Mainbrucke (Old Main Bridge). On your guided sightseeing tour, visit the magnificent baroque BISHOP’S Residenz, home to the largest ceiling fresco ever painted. Then, there’s time to relax, do some shopping, or stop in a Konditorei for a mouth-watering pastry and a cup of coffee—a German afternoon tradition. Enjoy another pleasant morning of sailing, and before lunch, attend an Onboard Lecture to learn more about the European Union. In the early afternoon, arrive in medieval Bamberg, former residence of one of Germany’s most powerful imperial dynasties and today a UNESCO World Heritage Site. Your included guided walk takes in its historic center, with the great 13th-century Romanesque cathedral and the fascinating Altes Rathaus (Old Town Hall)—built on an island in the middle of the Regnitz River when the bishop refused to give the townspeople land for a town hall! Early this morning, arrive in Nuremberg and after breakfast, drive to Munich, the capital of Bavaria. With its historical museums, splendid English Garden, traditional cafés, and delightful shops, Munich has plenty to see and do. A GUIDED TOUR will show you the highlights of this fascinating city, including Nymphenburg Palace, summer residence of the Bavarian monarchs; Marienplatz with its Old and New Town Halls; and the gothic Frauenkirche, a prominent landmark for Munich. Then, enjoy time on your own in this vibrant city. Watch the famous Glockenspiel, which recreates a royal wedding from the 16th century; linger at an outdoor café; visit St. Peter’s, the oldest church in town; or maybe relax alongside the locals at one of the many Biergärten or breweries to sample one of the Bavarian beer specialties. Return to your ship in the afternoon. Although 90% of Nuremberg’s Old Town suffered extensive damage during WWII, much of it has been restored to the glory it once knew as the unofficial capital of the Holy Roman Empire. Today, choose either an included guided Sightseeing and marvel at this thousand-year-old city’s medieval fortifications, extraordinary gothic churches, and the Kaiserburg (Imperial Castle), or join a more specialized “Nuremberg Rally Grounds” tour. During free time, be sure to make a wish at the beautiful fountain in the Hauptmarkt (main square). Legend says your wish will come true if you turn its gold ring three times. Then, enjoy a tranquil afternoon of cruising and take in an interesting Onboard Lecture about the engineering marvel that is the Main Danube Canal. Arrive in Regensburg after breakfast. Dating back to the time of the Celts around 500 BC, Regensburg is one of Germany’s best-preserved medieval cities. Established during the Holy Roman Empire and the only German city not bombed during WWII, Regensburg has at least 1,300 listed buildings of “historic interest.” Architectural highlights of your GUIDED WALK include the Altes Rathaus (Old Town Hall), built in the 13th century, and Porta Pretoria, gates to an ancient Roman fort built in 179 AD. Wander through the city’s lanes and alleys to discover the many mansions with high towers. Wealthy families built these towers to emphasize their status and wealth during the Middle Ages, and many still remain today. Walk across the 12th-century Steinerne Brücke (Stone Bridge), the oldest of its kind in Germany. Grab a beer and enjoy an included SNACK at the Historische Wurstküche (Old Sausage Kitchen), one of Germany’s oldest restaurants. Here—where the locals congregate—feel the vibrant atmosphere and take in the remarkable views along the river. Before dinner, we’ll introduce you to some of Germany’s Famous Beers! This morning, dock in Passau. Uniquely located where the Inn, Ilz, and Danube Rivers converge, Passau is a maze of narrow cobblestone streets lined with beautiful patrician houses. St. Stephen’s Cathedral, a masterpiece of Italian baroque architecture, houses one of the world’s largest church organs with 17,774 pipes. Take in the highlights on the included GUIDED WALK. Then, sail to Linz, Austria’s third-largest town, which lies on both banks of the Danube and is an important industrial town and busy river port. Alternatively, choose from several full-day optional excursions: to Salzburg to see some of the Sound of Music sights; the popular “Romantic Austria” tour; or to Český Krumlov in the Czech Republic, a UNESCO World Heritage Site. Rejoin the ship in Linz. This morning, enjoy a guided visit of Melk’s magnificent 11th-century Benedictine Abbey, one of Europe’s largest monasteries. The abbey houses an ornate library with over 80,000 printed books and 2,000 manuscripts. Words cannot describe the splendor of the church with its frescoed ceilings, stunning high altar, marble statues, and 210-foot-high cupola. During lunchtime, cruise through the picturesque Wachau Valley. Pass the magnificent baroque Stiftskirche with its blue façade, the landmark of Dürnstein, arriving in Vienna this evening. Known as the “City of Music,” it inspired the creative genius of Mozart, Beethoven, and Strauss. An optional concert is available tonight. Once the center of the mighty Habsburg Empire, Austria’s magical capital on the blue Danube is a showcase of gilded architecture. This is home to the lavish Hofburg Imperial Palace complex with its Vienna Boys’ Choir and dazzling Lipizzaner stallions; the neo-renaissance Vienna Opera House; and awe-inspiring St. Stephen’s Cathedral—plus, countless other sights shown to you by your Local Guide during your included CITY TOUR. Shop in the delightful pedestrian Kärntnerstrasse, and be sure to take a break and enjoy a piece of decadent Sachertorte or Apfelstrudel in one of the classic Viennese coffee houses, historic institutions that helped shape Viennese culture! In the late afternoon, leave Vienna for Budapest. Spanning the banks of the Danube, Budapest is one of Eastern Europe’s liveliest cities. Whether you’re seeing the sights, shopping for handcrafted embroidery or Herend porcelain, or basking in the coffee house culture over a rich cream cake in the renowned Gerbeaud Café, Budapest’s unique energy is positively palatable. On your guided sightseeing tour, see Heroes Square as well as the massive hilltop castle complex with its remarkable Fishermen’s Bastion and 11th-century Matthias Church, the coronation spot of several Hungarian monarchs. Be sure to take note of the city’s eight bridges—many famous sights in and of themselves—which connect ancient Buda on the right bank with Pest on the left. You may even want to walk across Chain Bridge, built in 1849 and a symbol of Budapest. Perhaps visit St. Stephen’s Basilica; shop at the Great Market Hall and purchase paprika at one of its 180 vendor stalls; wander around the Royal Palace grounds; or stroll along Váci utca, the main shopping street. With 2013 came another exciting Suite Ship. 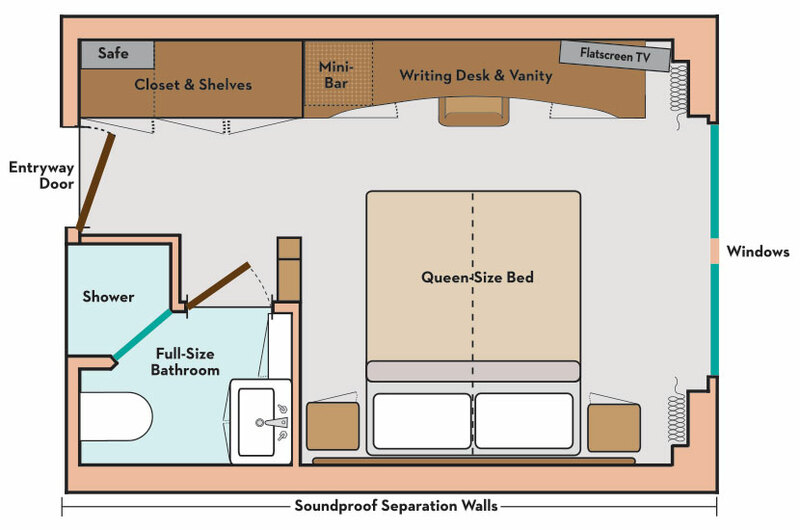 The Avalon Artistry II delivers an intimate setting, along with two full decks of suites featuring Wall-to-Wall Panoramic Windows that transform the living space into a unique Open-Air Balcony. With 200 square feet, Panorama Suites are more than 30% larger than the industry standard, giving you the rare opportunity to wake each morning to the enchanting scenery and fresh breezes. 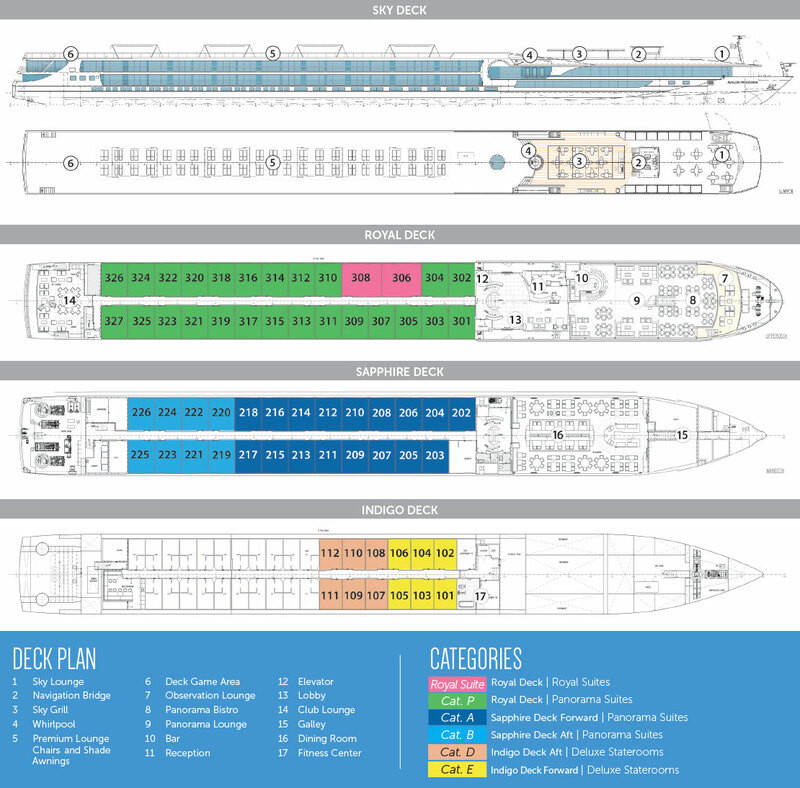 Onboard amenities include a complimentary Internet Corner and Wi-Fi access, an expanded Fitness Center, and a spacious Sky Deck with premium lounge chairs, shade system, whirlpool, and the delightful Sky Bistro.